This summer, I had the great pleasure of working with Oliver Ma, a 2015 graduate of Irvine’s University High School and now a history and political science student UC Berkeley, to create a new Irvine non-partisan student group called Future Chinese Leaders of America (FCLA). In just a few weeks, Oliver and current Irvine Chinese-American high school students Marvin Li, Ted Xiang, Leo Krapp, Michelle Tang, Michelle Liu and others successfully created this extraordinary club through their own initiative and dedication. 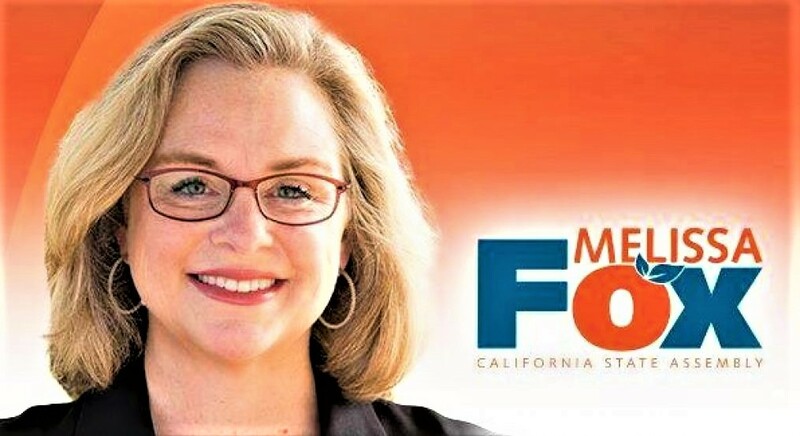 My role in the formation of FCLA was encouragement, mentoring, and connecting Oliver to various California Chinese-American political leaders such as State Controller Betty Yee, California Board of Estimate Chair Fiona Ma, and State Treasurer John Chiang, who spoke at an early FCLA meeting. Oliver and I recently discussed the formation and future vision of the Future Chinese Leaders of America with KUCI’s program “Ask a Leader” with Claudia Shambaugh. Our discussion begins at 1:42 and continues to 29:38.
by Kristen Moulton, The Salt Lake Tribune, reposted with permission. 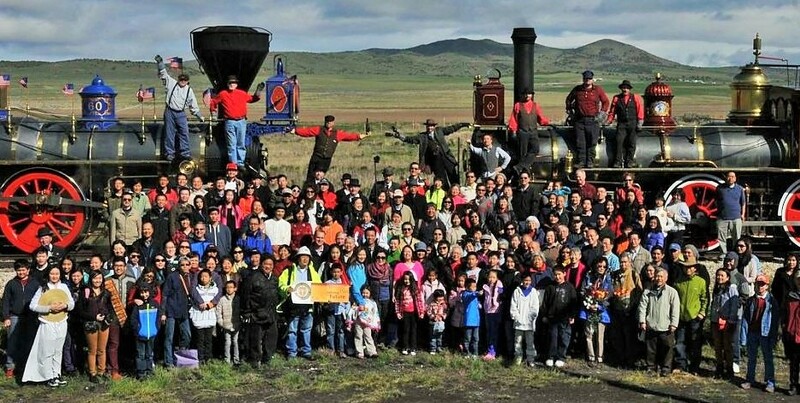 In what an organizer called a “photographic act of justice,” some 200 Chinese Americans, Chinese citizens and other Asian American friends posed here Saturday on the 145th anniversary of the completion of the Transcontinental Railroad. They were going for an iconic photo of their own, one to match the “champagne” photograph that has come to symbolize the celebration that day long ago when the Central Pacific from the West and Union Pacific from the East met on the windswept desert north of the Great Salt Lake. 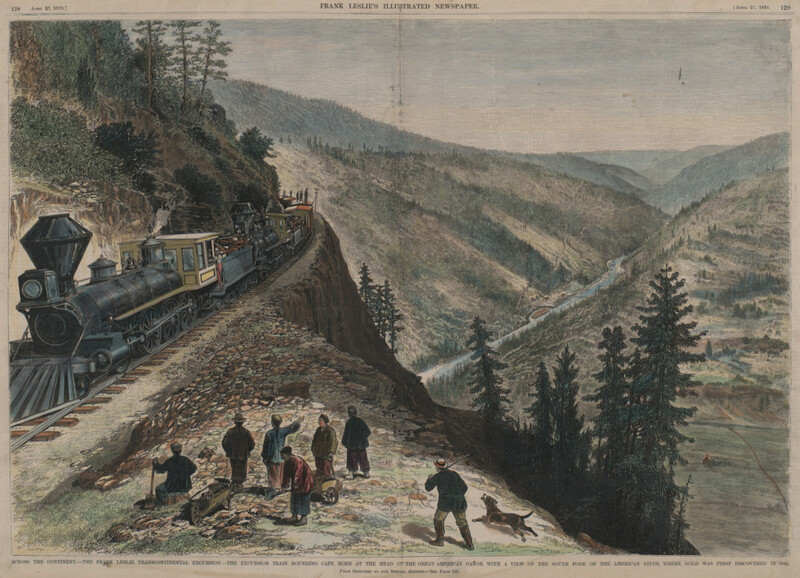 The meeting of the rails on May 10, 1869, after nearly five deadly, costly years, linked together the industrial East and the resource-rich West for the first time. A journey that previously took six months by ox-drawn wagon was reduced to six days. 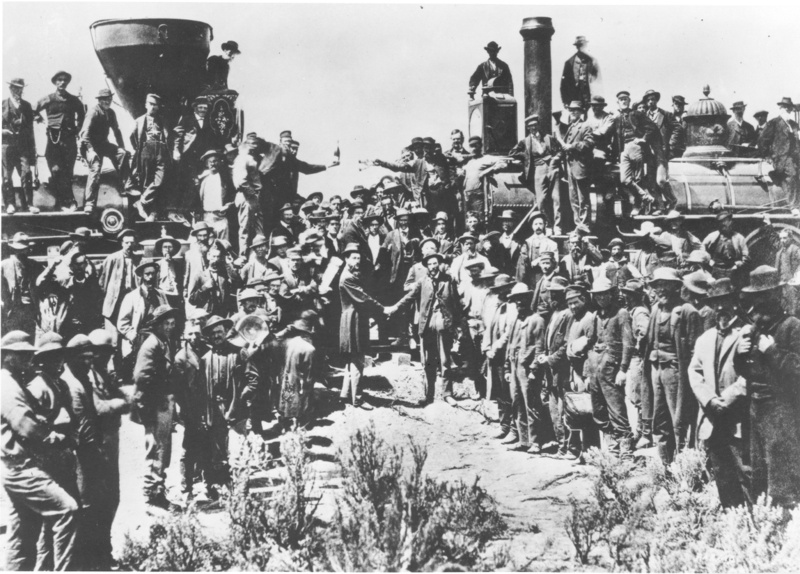 The most famous photograph from that day shows hundreds of railroad employees, executives and other celebrators — but none of the more than 11,000 Chinese workers who laid track over the Sierra Nevada, across the desert and into Utah. The Chinese workers’ contribution, said New York City photographer Corky Lee, is “a neglected and forgotten,” piece of American history. Saturday’s visit and photograph, he said, “is as an act of photographic justice.” The photographer worked with a Utah-based coalition, the Chinese Transcontinental Railroad Commemoration Project, to bring the group together on Saturday. He had the 200, including visitors from China’s Guandong Province, pose in front of the replica locomotives, as he did when a similar group came to the anniversary celebration in 2002. The group also walked to Chinese Arch, a limestone span several miles from the Golden Spike National Historic Site’s visitor center. Two of those participating Saturday, brother and sister Michael and Karen Kwan, in 2005 successfully petitioned the U.S. Board on Geographic Names to change the arch’s name from Chinaman’s Arch. Their great-great-great grandfather worked on the Transcontinental Railroad. Margaret Yee, whose great-great grandfather was a chef for the Chinese work crews, said she felt the presence of the laborers as she and a New York dancer and actress, Wan Zhao, walked together along the rail. Zhao, an immigrant from Mongolia, has been immersing herself in the history of the Chinese workers and immigrants, and performed a dance of prayer Saturday on the rails. It’s a bit of sore spot for some in the Chinese American community that they had never been invited to help reenact the driving of the rails. Norm Nelson, the president of the Golden Spike Association, said members of the Chinese community have long been involved in other parts of the celebration, including the act of laying a wreath on the rails to remember those who died working on the railroad. But they have not been invited to re-enact the placement of the last spikes. “They weren’t part of that [original] ceremony,” Nelson, of Perry, said. Lee, however, notes that women also were not part of the original ceremony, although some were present that day in 1869. He notes there are no women in the iconic champagne photo, although women and children in costume are always included in the re-enactment photos. On Saturday, after Lee took photos of the Chinese American group, those in period costume were photographed. And then the two groups and hundreds of other celebration attendees were photographed together. Ze Min Xiao, the main organizer of Saturday’s visit to Golden Spike, said the coalition wants to steadily increase the number of Asians who participate each year. It also wants more recognition from political leaders, to create a supplemental curriculum for Utah classrooms, and to archive the oral history stories of Asian Americans. It’s interesting, she said, that the descendants of the Chinese laborers, who were forced to return to China by American law, later immigrated to the United States. Karen Kwan, who teaches psychology at Salt Lake Community College and is running for the state House, said the railroad workers’ contributions deserve a more prominent place in Utah’s historical consciousness. The exhibit covers the time period from the mid-19th Century – when consecutive years of drought in China coupled with the discovery of gold in California led thousands of Chinese workers to travel across the oceans to work in the gold mines, and then in the construction of the railroads, in the American West – to the years of discrimination, hardship, and expulsion under the Chinese Exclusion Act from the 1880s to the early 1940s – to the present, when Chinese Americans are celebrated for their accomplishments and contributions across numerous fields, including journalism, sports, politics, medicine, music, film, architecture, and science. Among the Chinese Americans featured in the exhibit are Samuel C. C. Ting (Nobel Prize in Physics, 1976), Steve Chu (Nobel Prize in Physics, 1997), Roger Yonchien Tsien (Nobel Prize in Chemistry, 2008), Anna May Wong (first Chinese American movie star and outspoken advocate for Chinese American causes), I. M. Pei (Chinese American architect often called the master of modern architecture), Ang Lee (Academy Award, Best Director, 2005 and 2012), Elaine L. Chao (U.S. Secretary of Labor, 2001-2009), Judy Chu (b. 1953, first Chinese American woman ever elected to the U.S. Congress), Yo Yo Ma (b. 1955, Grammy Award winning cellist), Maya Lin (b. 1959, designer of the Vietnam Veterans Memorial in Washington, D.C.), Michelle Kwan (b. 1980, Olympic and World Champion figure skater), Jason Wu (b. 1982, fashion designer), and Jeremy Lin (b. 1988, outstanding college and NBA basketball star). I also had the pleasure of discussing the exhibit – and the crucial role that cultural diversity and immigrant communities have played in the success of Irvine – with the principal of the Irvine Chinese School, Yulan Chung, and the president of the Irvine Chinese School’s Board of Directors, Albert Tseng. The Irvine Chinese School is truly an Irvine treasure. 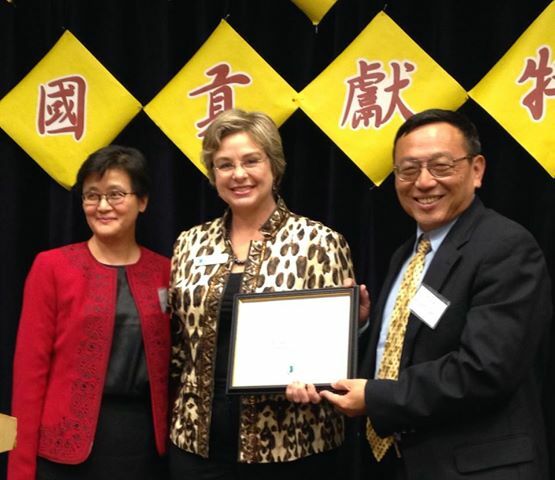 Founded in 1976, the mission of the Irvine Chinese School is to promote Chinese language learning, preserve Chinese heritage, enhance the understanding of the values of Chinese culture, and to advocate for Cultural diversity in America. Located in the beautiful new South Coast Chinese Cultural Center in Irvine, the Irvine Chinese School is largest Chinese school in Southern California, with more than a thousand students enrolled in classes ranging from traditional Chinese phonetics, writing, grammar and conversation, to Chinese customs, folklore, painting, calligraphy, performing arts and other aspect of Chinese culture. Visit “Immigrants Building America” and experience the struggles and triumphs of Chinese immigrants in America and learn about the many contributions of Chinese Americans to building the ongoing and still-unfolding American Dream. “Immigrants Building America” speaks to every immigrant community and every American. 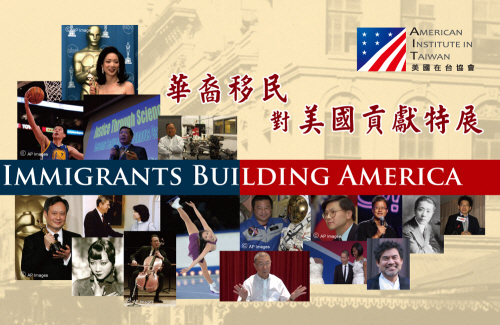 What: “Immigrants Building America” – Traveling exhibit featuring stories and photos of how immigrants from Taiwan and China have contributed to the growth of the United States. Click here for an NTDTV.com news report (in Chinese) about the exhibit and the opening ceremonies.